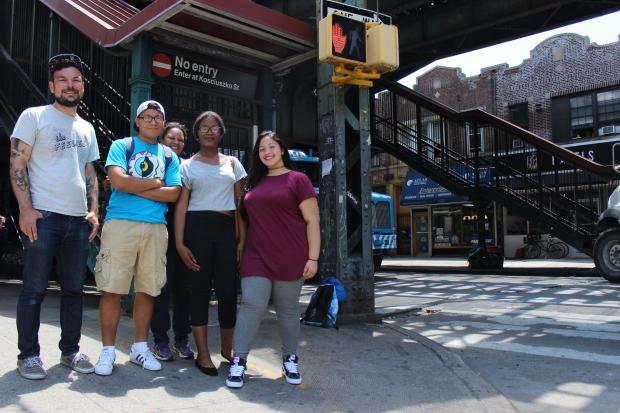 BUSHWICK — When a group of high schoolers began dreaming up ways they could improve the traffic-snarled, trash-littered, blighted section of Broadway, their parents shrugged, city workers condescended and the MTA ignored their requests for a meeting. The senior honors students at EBC High School for Public Service ignored the apathy from the adult world and managed to secure $235,000 in funding from Councilman Antonio Reynoso's discretionary capital funds which will aim to begin restoring Broadway, a once bustling commercial strip. Now their plans, which include painting murals for businesses along the block, fixing the street's crosswalks, patching cracked pavement and sidewalks and creating a merchant's association along the block, may actually see the light of day. "We're just kids," student Jessica Ruiz, 18, said. "But wow we made a difference." On Thursday, their teacher Ana Garcia will meet with Reynoso's office to figure out how to prioritize their ideas so that next year's class can help oversee how the funding, which the councilman's office has planned to funnel to the Department of Transportation, will be spent. Reynoso's involvement with their project first began last fall when Garcia invited him to attend one of their classes, Garcia said. His office then appointed a group of students from the class to a task force along with representatives from several city agencies where they began to address issues on Broadway. This week they learned the councilman set aside nearly a quarter of a million dollars toward the proposal for the street they'd finished by the end of the school year called Brighten Broadway. "Oh my God, oh my God, oh my God," a giddy Garcia exclaimed upon hearing the news. "We're gonna do everything we want to do!" Efforts to fix up Broadway began at EBC High School for Public Service back in 2013 with a seemingly simple ask from the MTA. Teachers and staff petitioned the MTA to open the gated subway entrance to the Kosciuszko J train stop on Dekalb Avenue so that in the winter students don't have to trudge through the snow and ice an extra three blocks to get to school. Teachers and students said they've been in contact with the transit agency but they've gotten the same, noncommittal response the MTA gave other transit advocates hoping to get closed entrances opened. An agency spokesman claimed the school had never contacted the MTA directly but that they are studying the issue of closed entrances. Garcia said their lack of action has been frustrating. "We see workers come in and out, two or three at a time," Garcia said. "[The entrance] clearly works." But while the MTA hasn't budged, the closed entrance got staff and students thinking about other ways they could revamp Broadway for students, residents and businesses along the block. "There is garbage on every single corner, either a refrigerator, a bed, it's disgusting," said Ruiz, cracked pavement on her way to school made her think she would break an ankle, she said. And there are "closed down stores rusting, construction areas not even being worked on, vacant areas." Because of the above-ground train tracks, "it's dark even in the morning," Ruiz said. Since they started drawing attention to issues on Broadway and meeting with different city agencies they've already seen some changes, even before any additional funds are funneled to the area, Garcia said. The DOT put up parking meters, which has alleviated much of the traffic that backed up when trucks had to double park to make deliveries, she said. This spring they held a town hall meeting attended by a slew of city agencies as well as community members. Everyone they'd invited showed up except the MTA, Garcia said, another jab in the gut to students and teachers. And an emissary from one of the city agencies who did show up expressed her displeasure that she had to meet with students loud enough for everyone to hear. "I thought we were meeting with city administrators not these lowly students," the city worker had said, according to Garcia and the students. But despite the often frustrating process of navigating city bureaucracy and the skepticism some grown-ups have shown them along the way, the $235,000 from Reynoso's office is proof that it was all worth while. "Sometimes we would slack off, Ms. Garcia would be like, 'This is real what we're doing,'" Ruiz said. "It's just crazy...I'm growing up, things are gonna change and I can change something."